The Dartry Mountains are among the most distinctive in Ireland, so it's unfortunate that their highest hill is one of the least distinctive in the range. Once one gets away from the signature steep lower slopes the upper reaches are lacking in interest save for the expansive views and the crowning RTE transmitting contraptions. This is the highest top in Sligo, and the highest point in Leitrim also resides on its summit slopes. 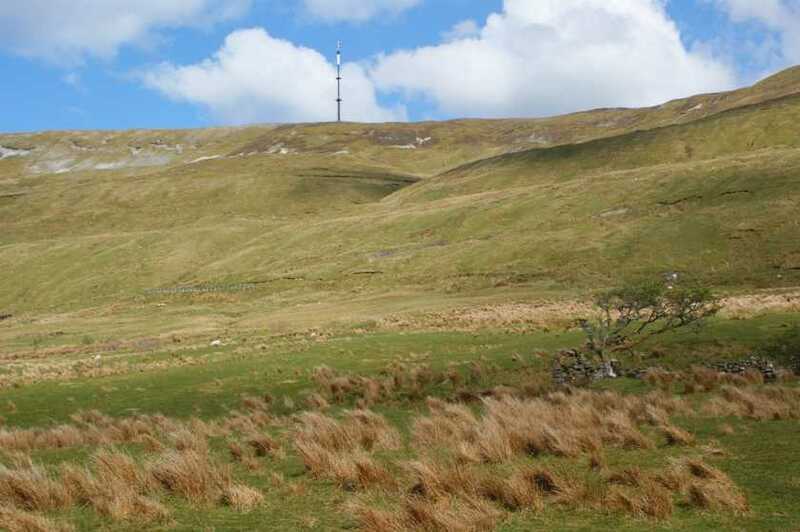 The most straightforward route of ascent follows the access road to said transmitters which snakes up from the head of Gleniff to the north starting at (744 468 A); parking is available but very limited hereabouts. More judgment is required in approaching from Glencar to the south; starting from the car park 200m west of the Glencar Waterfall (756 436 B) follow the track winding north through the trees to the top of the escarpment, forking right at a junction and then making your own way across the plateau to Truskmore, where the RTE station will be obvious in good conditions.